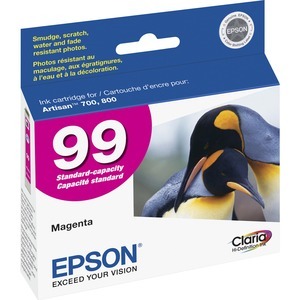 Ink cartridge is designed for use with Epson Artisan 700, 710, 725, 730, 800, 810, 835 and 837 printers. Claria Hi-Definition Ink delivers long-lasting photos that are smudge-resistant, scratch-resistant, water-resistant and fade-resistant. It is the ultimate combination of photo quality and longevity - better quality than the lab.